Ricoh Aficio MP 161, 161F, & 161SPF - GT Business Systems, Inc. 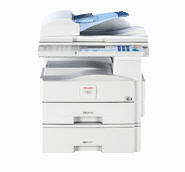 The Ricoh Aficio MP 161 packs multi-functional productivity into a small footprint, saving you both space and time. The MP 161 series combines four office devices so all your printing, scanning, copying, and faxing can be done from the same source. Available in three different configurations offering 16MB, 128MB, and 384MB of RAM, choose the model that best fits your workflow needs. General features are 4MB memory, 12-Hour memory backup, 150 Speed and 16 Quick Dials, LAN, Internet and IP Faxing, standard 50-sheet automatic reversing document feeder, standard automatic duplexing, 100-sheet bypass tray, and an easy-to-use, intuitive control panel. Printer features include standard duplex printing. Scanner features deliver 22 ipm black & white and 9 ipm color with a scanning speed of 200dpi. Facsimile features offer Super G3, a 33.6Kbps modem, and document send times at two seconds per page. To keep up with today's office, a mutifunctional system must provide the best of all worlds. It should be simple to operate, yet have varied functionality; print at break-neck speeds, yet produce brilliant image quality; offer tight document security, yet be easily accesibile. The Aficio MP 161 meets these demands and goes beyond them, offering environmentlly friendly features: another characteristic of leading-edge thinking.